Do you have a favorite painting by a “master” that you’d like to see as one of my Micro Master Series works? If so, please email me with the name of the artist and painting! 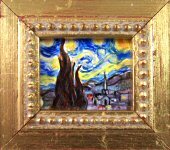 This “micro” is my rendition of Van Gogh’s famous painting, Starry Night. I love doing these little copies. It gives me an opportunity to really study a master painting, from the color to the brushstrokes. This has been painted and framed with archival materials. It will be shipped in a beautiful gold box with cotton batting. It will be sent as shown above, with hanging rings affixed and a gold string to hang it “salon style”. If you would prefer it with a pin back, I can remove the little eye rings for the thread, and attach a pin back instead. $50.00 plus free shipping and insurance within the Continental United States. For local sales, shipping charge will be allocated to NYS Sales Tax. Please email me at JamieWG@aol.com for International purchases or with any questions. 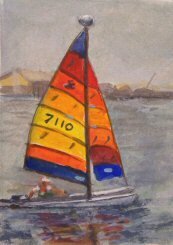 Sailing in Florida is a miniature, ACEO size painting, done from a photo. When my husband saw the painting, he said he could imagine it framed on his desk for a mental vacation from time to time! I have such a great time painting occasional ACEO size works. 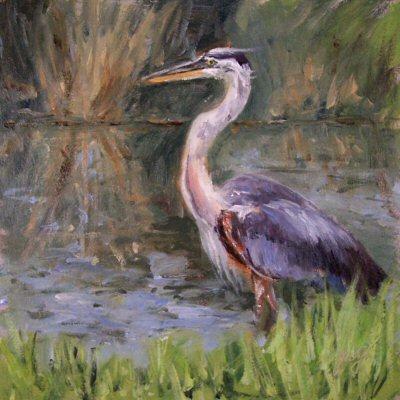 ACEO stands for Artist Cards Editions and Originals. 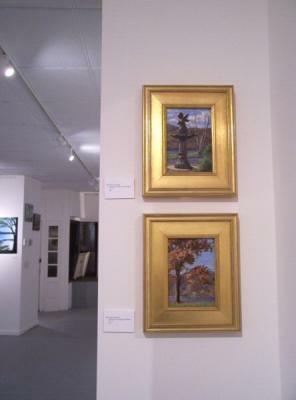 They are collectible paintings in a standard, miniature format. The size is 2.5×3.5″, like baseball cards and playing cards. They are so enjoyable to paint and collect that every so often I do a few of them. 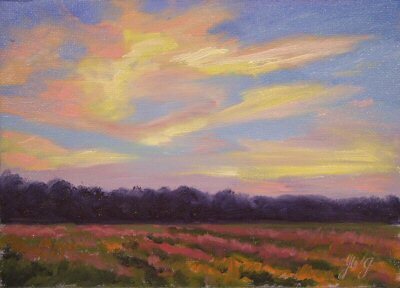 Some artists sell prints of paintings in that size as ACEOs, but mine are always one-of-a-kind originals. 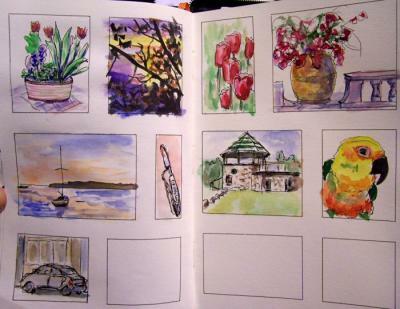 ACEOs are truly fun to collect for those who love art. Everybody can find a place for these little gems. It’s an easy way to collect work from some favorite artists. What a gorgeous day we had at last. My friend Sue and I painted out by the lakeshore here. I love painting the seasonal changes out on the field by the lake. In another week or so, the color will be quite different. This charming miniature, based on Matisse’ famous 1944 painting “Annelies”, is in a gold wood frame. It can be sent either with a pin back, or with a gold string to hang ‘salon style’. (Specify which you’d like.) 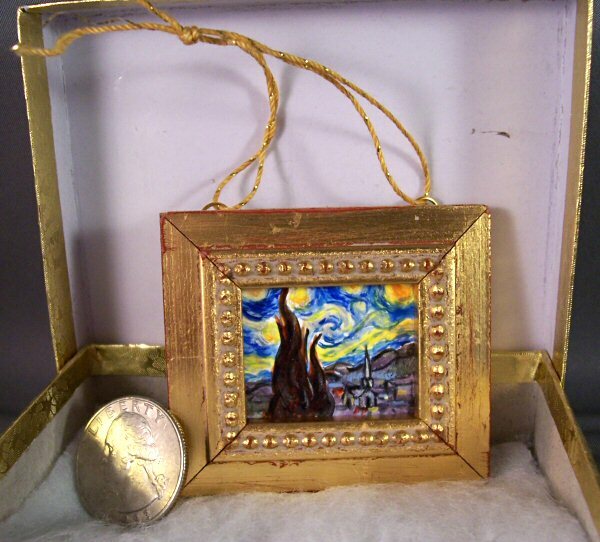 Tiny minis like this can also be beautifully displayed on small tabletop easels. It will be sent in a little gold box, just like a tiny treasure. I chose a challenging subject for such a tiny copy and it took me ages to get all the details in place. 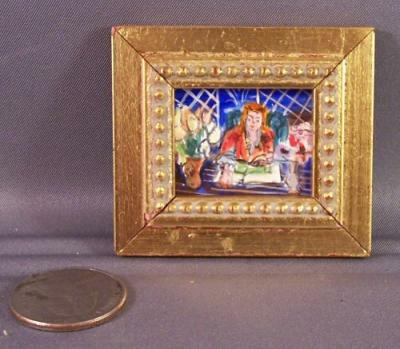 The painting itself measures 1×1.25″. With the frame, it is 2×2.25″. The quarter is in the photo for size reference. It’s hard to appreciate the intricate detailing of this piece when seeing it online at larger than actual size! This is one of those pieces that’s hard for me to let go of. I definitely want to do more of them. 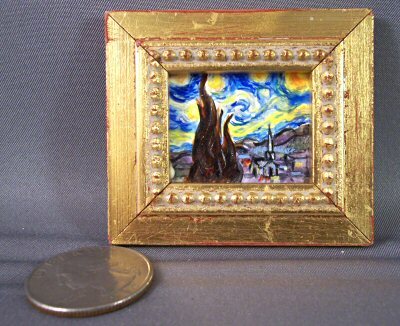 I’ve selected a Van Gogh painting for my next tiny copy! I finally hauled myself down to the studio late this evening and did a bunch of quick sketches inside little rectangles in my sketchbook. The two page spread measures 8×10. Most of these sketches are from the Wetcanvas Weekend Drawing Event photos, with a couple of other things thrown in, like my Jenday conure, Lulu. I didn’t quite finish up the page tonight. It’s getting late, so I’ll have to wrap it up as I go through the week. Sketching is a wonderful way to get in a little artwork on those days when I don’t have a large block of time for oil painting. Lulu and Lucy came down to the studio to look over my shoulder and keep me company. Sometimes it gets lonely down here, so I have an extra birdcage and bird play gym in the studio to bring down some avian companions when I’m not working in oils. They are slowly getting over their camera shyness. 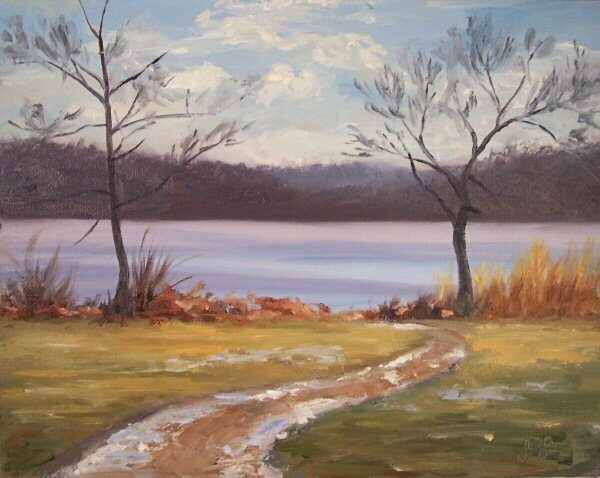 I’m itching for the weather to warm up and the spring colors to arrive, so that I can get out for some plein air painting! $110.00 plus $10 shipping and insurance within the Continental United States. For local sales, shipping charge will be allocated to NYS Sales Tax. Please email me at JamieWG@aol.com for International purchases or with any questions. Who isn’t getting ready for their springtime gardening this time of year? I know I’m eager! This is a scene of a garden at Stone Barns, which is part of the Rockefeller property in Pleasantville, New York. 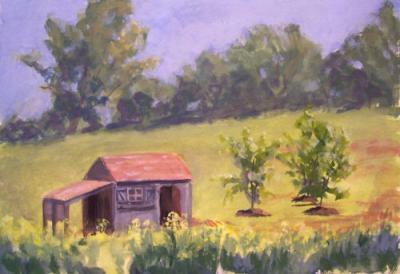 The big open fields, old structures, gardens, and farm animals make it a delightful place to paint at any time of year. This painting is beautifully double matted with a blue inner mat and ivory outer mat, to fit perfectly into any 8×10 standard frame. Bring a little springtime into your home! The painting is also available framed. Email me if interested in purchasing this painting framed. 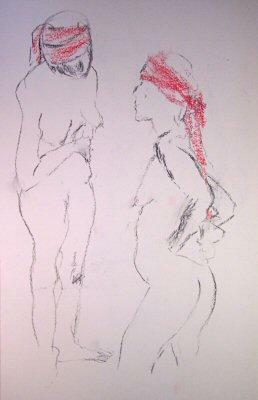 The Buy Now button below the image is to purchase the matted, unframed painting. 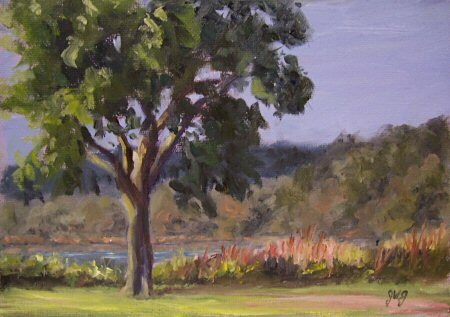 The painting I posted yesterday made me remember this plein air painting I did at the same park. Although it was pretty much finished on location, when I got it home and looked at it with interior lighting, I decided I wanted to change a few things. I set it aside, and there it sat for a long time. I finally pulled it out today to adjust some color and make a couple of changes. I’m much happier with it now. It’s ready for a frame! This darling 4×4″ painting is the Chinese Friendship Pavillion at Lasdon Arboretum, in Somers NY. The strong reds of the structure stand out against the greens, with the deep blue sky reflecting in the water. 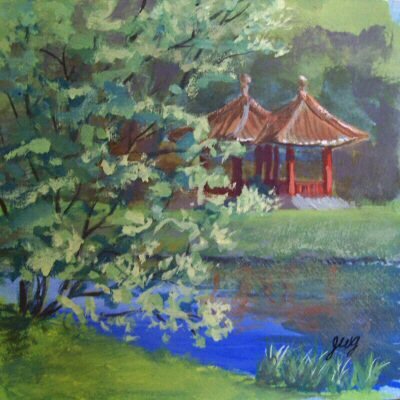 This is painted in casein, which is an archival milk-based, artist quality medium, wonderful for its durability, strong color, quick drying, and mat finish. The painting was then varnished to give it a bit of sheen. 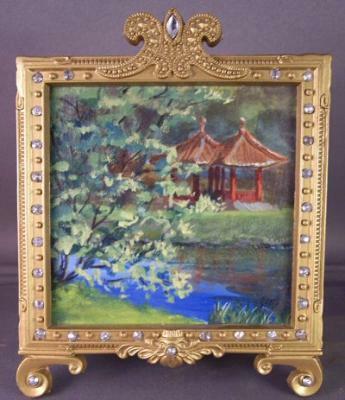 I am including the little jeweled frame (shown below with the painting) at no extra charge, so that you can display it right away. I started a large version of this scene on location some time ago, and it’s not quite finished. Seeing this image here, I realize how much I love this scene. I think I’ll spend tomorrow touching up the big one so that I can finally see that done. Come back again to see the 20×16″ oil painted version! I spend my Sunday mornings with a group of artists in a figure drawing studio, where we have a different model every week. 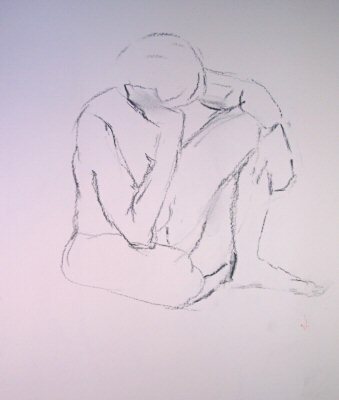 We practice drawing from poses ranging from one minute to 25 minutes, in whatever medium we choose. It’s no wonder the great masters always worked on drawing figures from life. There is no better practice for the hand and eye, and it is a skill that carries over to all subjects. 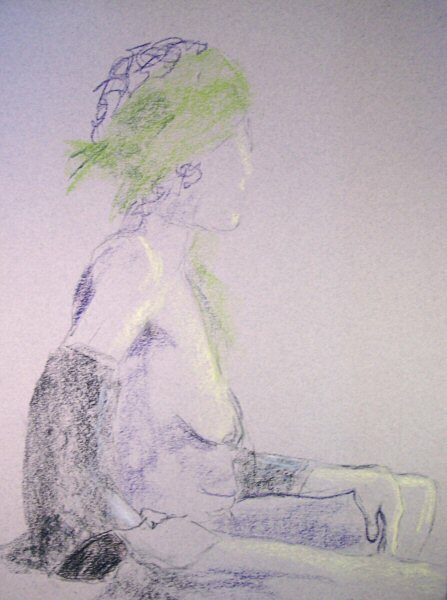 The drawing above is in pastel on Daler Rowney pastel paper. I love the different colors it comes in and the woven texture. 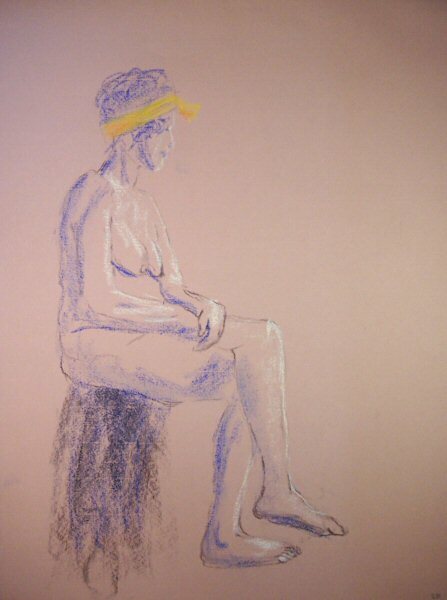 This was a 20 minute pose—the last pose of the session. We were all a little sleepy by then, even the model! 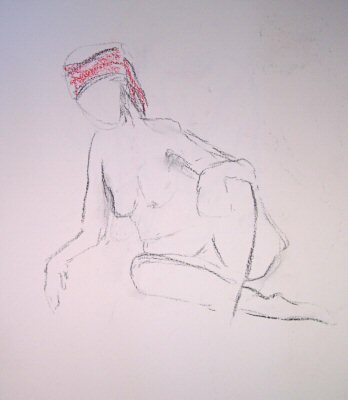 Below are some additional sketches from the session. 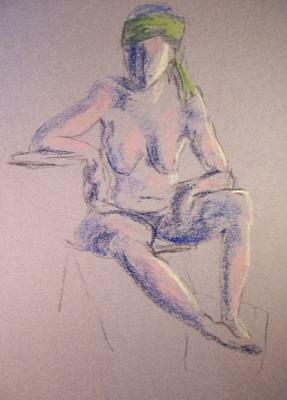 I hope you enjoyed this trip to open studio life drawing with me! Today was the International Sketchcrawl #13, and although I didn’t get nearly as much sketching in as I’d hoped, I did finish up a two-page grid in my sketchbook that I’d started a couple of weeks ago. This is 8×10″, across a two page spread. They are: the view from my father-in-law’s apartment overlooking the Hudson River, inside another relative’s home, scenes from the car while waiting for my daughter outside the gym, a compositional sketch for a painting, the office building for the Rockefeller State Park Preserve, waiting again in a waiting room, and a couple of things in my studio. Tomorrow is the official International Sketchcrawl #13. That means that artists around the globe will be packing up their sketchbooks, pens, pencils, brushes and paints, and heading out to do as many sketches of their day as they possibly can. Whether you’re an “artist” or not, anybody can participate by just doodling your surroundings as the day goes by. 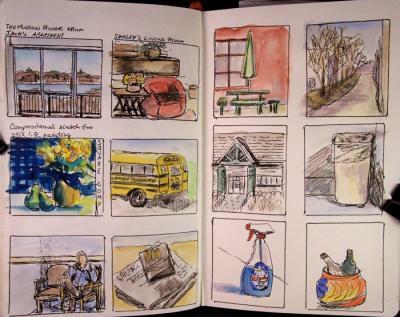 Join me in celebrating the International Sketchcrawl by documenting your day in drawings. I hope to have a few pages to show by the time I post here tomorrow night. 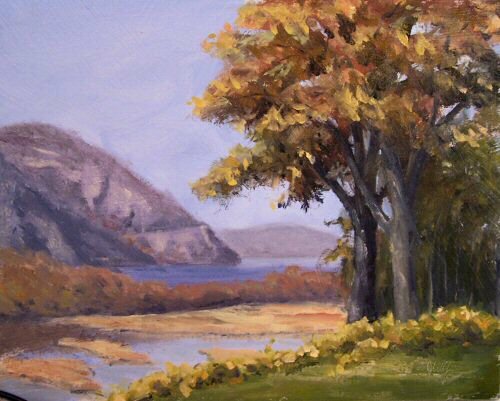 This was painted from a photo of one of my favorite spots overlooking the Hudson River in Garrison, New York. All the snow started melting today here in the northeast. I went to Leonard Park in Mt. Kisco, New York to do some painting. 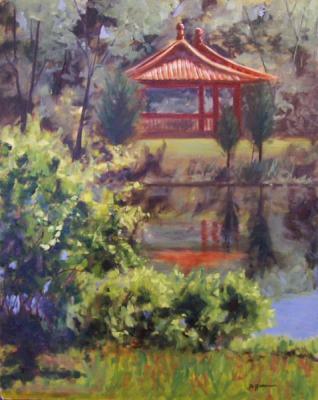 There is a lovely Chinese style pavillion there overlooking the pond. The ice was starting to melt as the sun peeked in and out of the clouds. It’s nice to finally get a little taste of spring! Last night was the opening of the Hudson Valley show at Freshman Fine Arts in Beacon. Many thanks to my friends and fans who came to see the show. 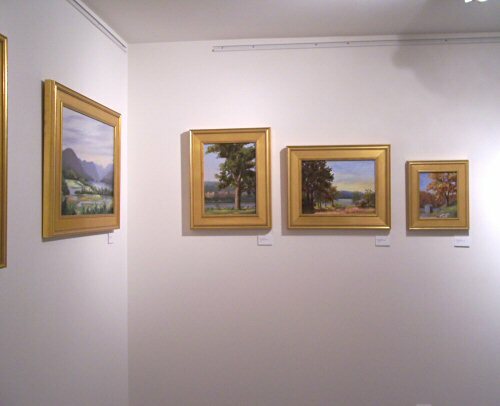 Below are a few photos of my paintings there. 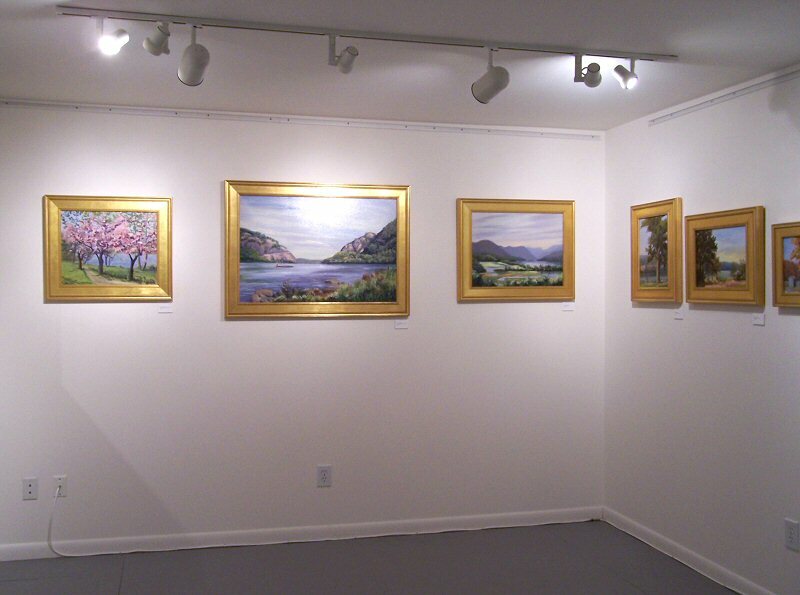 Please contact the gallery directly at 845-440-8988 if you see something that interests you. The paintings range in size from 5×7″ up to 24×36″. The show is really wonderful, with a wide variety of colorful work ranging from abstract to contemporary realism. Please do stop by and see it if you’re in the area. This is one of my favorite trees along the lakeshore here by my house. The trunk and branches have so many interesting twists and turns, and the foliage turns a bright gold in late fall. I’ve been meaning to get out there to paint it in winter. I guess I’d better hurry up and do that before all the snow is gone! I have eight paintings ranging in size from 5×7″ up to 24×36″ in a show opening tomorrow at Freshman Fine Arts in Beacon, NY. 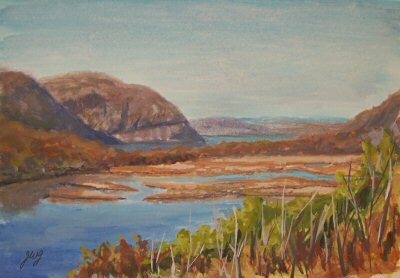 Please join us for some wine and munchies between 6 and 9pm to see different artists’ interpretations of the Hudson River Valley, from abstract to realism. There’s always lots going on during Beacon’s monthly “Second Saturday”. Shops and galleries are open late, all the galleries have their new openings then, there are glass blowing demos at Hudson Beach Glass, and wine tasting at the Artisan wine shop. There are wonderful restaurants and antique shops. It’s a great way to spend a Saturday night. Come join the fun! $440.00 plus $20.00 shipping and insurance within the Continental United States. For local sales, shipping charge will be allocated to NYS Sales Tax. Please email me at JamieWG@aol.com for International purchases or with any questions. 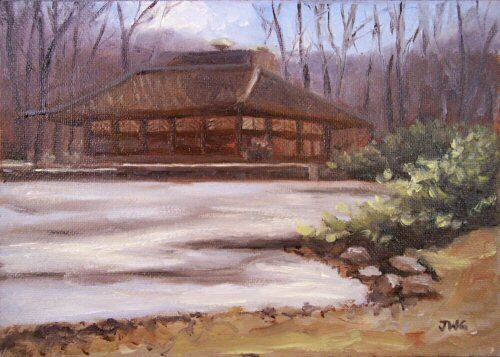 When out painting landscapes on location (plein air), artists encounter issues with changing light and having to work fast. Sometimes paintings need little fixes in the studio, such as picking out pieces of leaves that fell off trees, bumping up a few highlights, or adjusting color/value in spots to account for viewing with indoor lighting. 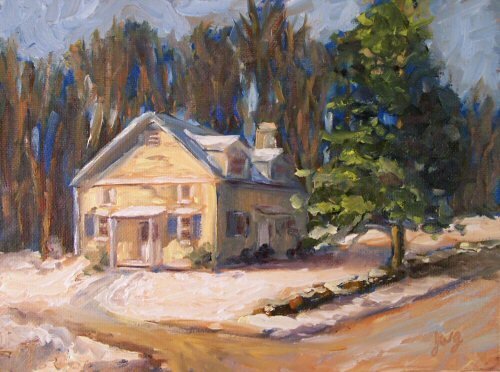 I have several paintings done on location that have been waiting patiently in the studio for small fixes of one kind or another. 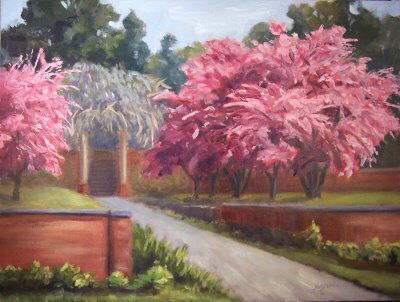 This painting was done last spring in the Italian Gardens at the Vanderbilt Mansion in Hyde Park, New York, and has finally received a few touch-ups. The cherry blossoms there are nothing short of stunning. I can’t wait for late April to roll around so I can paint cherry blossoms from life again! This is another scene from beautiful New Paltz, New York, painted from a photo I took there last fall. I’m moving my blog next week to its own domain name! I’ll also be changing blog software. My designer suggested I come up with my own top banner for the blog, so I thought, what better banner for a Hudson Valley Painter than a panoramic scene from one of my favorite painting spots overlooking the Hudson River! I’ve done tens of paintings from this location. I went through photos this morning of this overview from Boscobel, taken through many years and seasons. The photo I chose from which to paint the banner was one taken on a chilly November day. This is gouache, painted on Fabriano artistico. It’s 3×12, which is about the actual size of the banner, so I had to break out the teeny tiny brushes. Next I need to break out the Nikon to get a clearer image of it! $385.00 plus $20 shipping and insurance within the Continental United States. For local sales, shipping charge will be allocated to NYS Sales Tax. Please email me at JamieWG@aol.com for International purchases or with any questions. 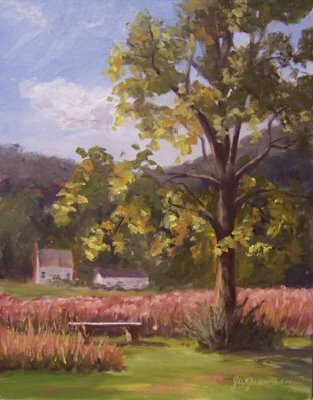 It was a gorgeous fall day at Ward Pound Ridge Reservation when I painted this on location, “en plein air”. One of the preserve managers lives in the house at the bottom of this hill. The red fall fields and views of the surrounding hills make this one of my favorite spots on the 4700 acre property. There is a paintable scene in every direction! They recently put in the bench by the tree, providing weary hikers with a perfect resting spot to view the serene landscape. Welcome to the USA Today readers! I’d like to give a big welcome to all the USA Today readers who are coming to visit my online studio/blog as a result of today’s article in USA Weekend. Thanks so much for stopping in and browsing through my paintings. The front blog page only holds 30 days of work, so you can see other paintings by clicking on the “Available Paintings” link at the top of the page, or the Category links on the right side of this page. Most unsold paintings not currently in galleries have Buy Now links so that you can pay by credit card or bank transfer securely through Paypal. Paintings are priced by size, hence the wide price range. I do lots of pet and landscape commission work, so feel free to contact me if you’ve got a special pet or scene in mind that you’d love to see in paint! Feel free to email any questions to me; there’s a link directly to my email on the right side of this page, under “Links”. I hope you enjoy your visit. There’s a new post nearly every day, so please bookmark my site and come back often to see what’s going on in the studio. I love Great Blue Herons, and often see them here on the brook behind my house. This one was painted from a photo taken by my sister. This is a 6×8″ compositional study in oils for a large painting I’m doing for the headquarters of Putnam County Land Trust, which is the building in the painting. (It used to be called Chickadee Haven by its former owner.) It abuts their 140 acre Peach Lake Natural Area. 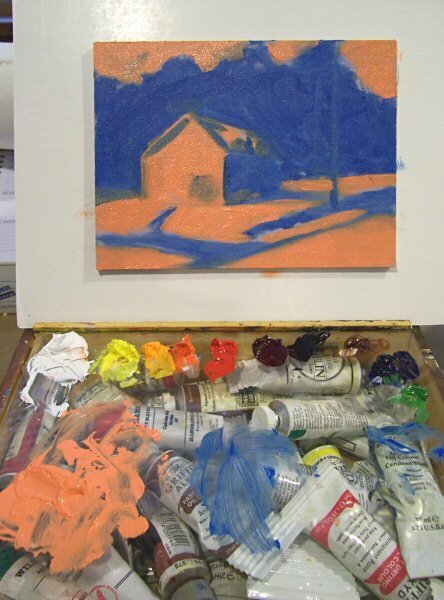 I felt like having a little color explosion today, so I did it using Charles Sovek’s cadmium orange/cerulean blue light/shadow underpainting. I always like the vibrancy and depth that combination yields. I’ll be doing the larger painting with more of a yellow/violet color harmony, rather than the orange/blue. I’ll be holding onto this painting until the larger one is completed so I can use it as a reference. 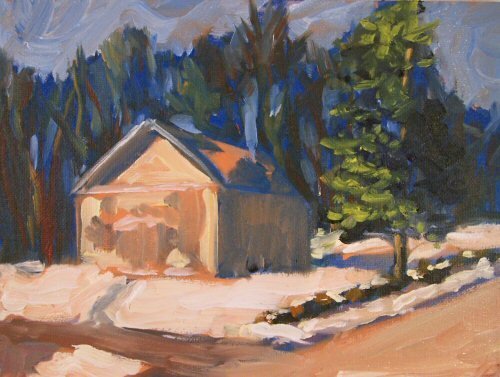 Click here to see gifts and personal items with reproductions of this painting that are available for purchase. More products with this image will be coming, so please check back soon! 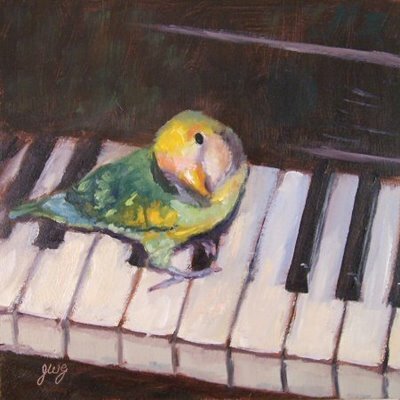 Many thanks to Rodney and Tamara Money for the photo reference of their adorable bird. BeBe won top bench placement in the African Lovebird Society Pet Writing Contest just a few weeks ago. He is a Dutch Blue Pied Peach-faced Lovebird. 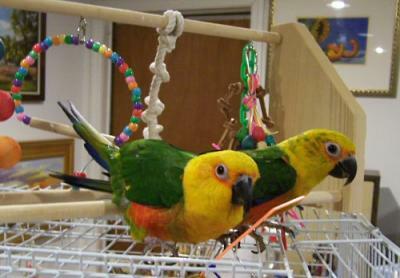 Rodney and Tamara are lovebird breeders in North Carolina. You can check out the cute arrivals at their website. Rodney is also a composer, so it’s not surprising that BeBe is playing a piano concerto. I probably don’t need to tell you how much fun it was to work on this painting, but I do think my lovebird, Mango, got a little jealous.